Please refer to our stock # 11179 when inquiring. This gorgeous oversized statement pin will surely garner attention when worn. 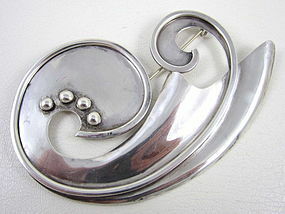 It is 5 1/8" long x 3 1/8 wide and is handcrafted from sterling silver. It has a wonderful scroll design with applied wire and ball details. The reverse has a "C" scroll closure with a secure pin stem. It weighs 68.8 grams and it is in excellent condition. It has no markings but is guaranteed to be sterling silver.